The ‘Suanthip Vana Resort’ has received the prestigious “Thailand Tourism Award 2004” for Outstanding Performance Resort Accommodation, Northern Thailand. 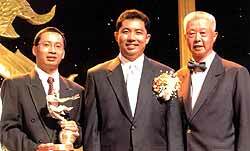 Minister of Tourism and Sports Sontaya Khunplome (center), flanked by the resort director Pravidhya Suvaruchiporn and Narin Kajai, the resort sales and marketing manager at the award ceremony. Suanthip Vana Resort is a nature lovers’ retreat, located on the highway linking Chiang Mai and Chiang Rai. It is promoted as a perfect place to achieve a real sense of relaxation, set in natural surroundings. The Resort was built in a 35 acre compound consisting of a high-vaulted lobby, modeled on the traditional architecture of the North, five individual teak pavilions, housing 30 spacious deluxe rooms and six Karen Hill Tribe style villas; Baan Pkarkeryor. Besides the numerous attractions of Chiang Rai Province, guests have a chance to experience the traditional lifestyles of the ethnic hill tribe villages in the highlands, tea plantations and macadamia farms and other activities including mountain biking, and special wildlife observation hikes. The World Airline Entertainment Association (WAEA) has awarded Thai Airways International’s (THAI) Inflight Magazine Sawasdee the first runner up Avion Award for Best Inflight Magazine. The announcement was made at the WAEA 25th Annual Conference and Exhibition held in Seattle, Washington, USA. The award winners were judged by a 26 member international panel included leading media executives, critics, producers, editors, and academics from the U.S., U.K., Hong Kong, Australia, Canada, New Zealand, Brazil, Lebanon, and Zimbabwe. Kanok Abhiradee, THAI’s president, said that THAI is very proud to be recognized in the Avion Award for Best In-flight Magazine, as his airline has been actively moving forward in improving in-flight entertainment, including the in-flight magazine. 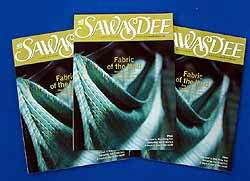 Last year, Sawasdee won two awards at the 17th annual ASEANTA Awards for Excellence. The May 2002 issue of the magazine featuring “A Simian Saga,” written by Jason Gagliardi, won the Best ASEAN Travel Article Award for its portrayal of the town of Lopburi in Central Thailand, while “Back in Time on Two Rails,” a feature story about train travel in Thailand by Morris Dye, won a Merit Award in the same category. During their winter schedule (31 October 2004 – 26 March 2005), Thai Airways International has confirmed that it will operate four daily flights on the route between Chiang Mai (CNX) and Mae Hong Son (HGN) every Tuesday, Wednesday, Friday, and Sunday, and three daily flights every Monday, Thursday, and Saturday, utilizing ATR 72 aircraft. The airline assures all passengers that its commitment to provide regular and convenient services to Mae Hong Son remain unchanged, especially during the December 7-26, 2004 period, due to high traffic demand. For more information, please contact THAI’s 24-hour reservation office at tel. 0-2628-2000 and 0-2280-0060. More than 300 types of organic fruits and vegetables, highland products, fast-growing bamboo plants, flowers for the garden, and more will be on display and for sale when the Royal Project Doi Kham Fair 2004 takes place next month. The annual fair will run this year between December 23-26, from 9 a.m. - 8 p.m. at the Arts and Cultural Museum of Chiang Mai University on Nimmanahaeminda Road. It will pay tribute to the contributions of Their Majesties the King and Queen to the Royal Project. Junnapong Saranak, the director of Tourism Authority of Thailand’s Northern Office, said the fair would promote high-quality products from the highland development projects. There will also be performances by the Royal Project Development Center’s members and cooking demonstrations by well-known TV and film celebrities from Bangkok. There will also be food and beverage stalls from the local food shops and restaurants as well as activities for youths, including making gift baskets, painting and singing contests. The International Geography Conference regarding “Southeast Asia Development and change in an era of globalization” will take place between November 29 to December 2, 2004 in Khon Kaen, organized by Prof. Dr. Sekson Yongvanit, director of the Research Center for Mekong Regional Tourism, Khon Kaen University (email: [email protected]). Under this broad heading, it is feasible to showcase the “Hovercraft Expedition Mekong” that was co-organized by Brooker Group and Diethelm Travel (Bangkok) in 2002 that covered nearly 3000 km of the river from Simao Port in Yunnan to its delta in the southern part of Vietnam. In his address “Mysterious Mekong”, tour director Reinhard Hohler will try to position, protect, and promote the different geographical, historical and economic aspects of the river. On hand will be a representative map of the river and its surroundings plus 72 specially selected photos to demonstrate the outcome of the expedition. The 72 photos (available on CD) will highlight the expedition via Jinghong in China through Myanmar, Laos, Thailand, Cambodia and to Ho Chi Minh City in Vietnam, displaying the hovercraft, photos of the six members of the expedition and some Mekong scenery from the Greater Mekong Sub-region. The transfer of the hovercraft around the Khon Falls will be dramatically exposed. Also, there is a visit to Angkor and the gravesite of the famous French shown, while Henri Mouhot in Luang Prabang will give the exhibition historical notes. Preparations to hold “Exhibition Mekong 2004” were completed after its opening ceremony at the Sheraton Chiang Mai Hotel on March 25 for the PATA Mekong Tourism Forum. The successful display of the exhibition was co-sponsored by the German Embassy in Bangkok. Now, it can move on to other venues and hotels that were involved with Expedition Mekong, such as Sofitel/Accor Hotels within the region. Sponsorship is welcomed from groups and associations that would value this presentation. LAO immigration authorities have announced no visas will be issued, either on arrival or through its embassies, for the period from November 22 to December 1 during the ASEAN Summit Meetings in Vientiane. The last-minute announcement comes as a shock to tour operators, who will have to cancel or alter itineraries for clients who do not already possess visas. A spokesman for the Lao Embassy in Bangkok said the decision to suspend visa approvals was made in order to insure security for delegates attending the conference. “Many hotels are already fully booked during the summit, so visitors would not be able to find lodging in any case,” he said. Meanwhile, in anticipation of hosting meetings for the ASEAN Summit next month, the Lao Plaza Hotel has opened a new conference room and renovated its executive floors and suite rooms. The new 200sq meter Plaza Hall accommodates up to 60 guests theatre-style. The US$2.5 million project also includes renovations to the deluxe suite and 33 executive rooms, with new desks, work areas, and pantries.